The Lancer Tactical CA-312 JPC Jumpable Plate Carrier in Black is the smallest, lightest, yet most mobile and versatile design of the plate carrier family. 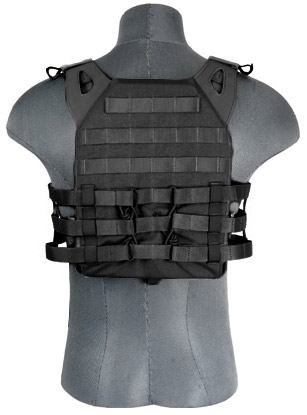 Shedding all the necessary bulk for the latest in load bearing techniques the Lancer Tactical JPC features a skeletal cummerbund system that still accepts MOLLE equipment like a champ yet provides breathabilty for some of the most uncomfortable areas for plate carrier wearers. 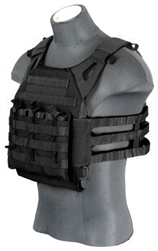 A integrated 3-magazines pouch system and admin panel are available and seamlessly integrated into the vest's front portion to provide the basic essentials every operator needs without the need for additional accessories. MOLLE systems can be found throughout the front and back panels to accept additional MOLLE equipment to suit any type of loadout needed. Despite its very minimalistic design the JPC still accepts full sized ballistic style plates (sold separately) and can be adjusted to fit users large and small through a series of hook and loop fasteners as well as elastic retention cords adorning the cummerbund. Designed for the rigors of battle, the Lancer Tactical CA-321 series are made out of Denier polyester nylon materials to keep up with you whether you're running, gunning, or under fire - it'll be sure to stay in one piece battle after battle.